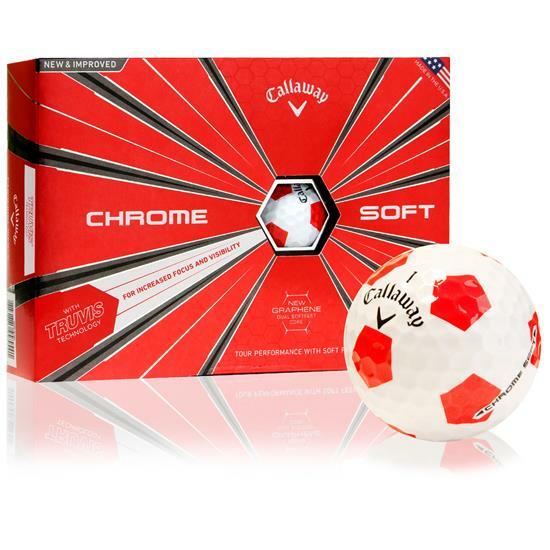 Improve distance and control around the course with Callaway Golf's Chrome Soft Truvis Red golf balls. The Chrome Soft has been engineered to provide tour-preferred feel with the technology to boost distance with optimal spin. The unique Truvis pattern with red accents gives golfers higher visibility on the course. Callaway has updated their inner Dual Soft Fast Core system with a graphene layer that allows for a larger inner core with a soft cover. The larger inner core allows for higher amounts of compression, providing the distance needed to get you closer to the pin. The same core that increases distance also reduces spin from drives, helping put the ball exactly where you need it. A dual core design means higher distance from longer clubs, with more precision from short irons. 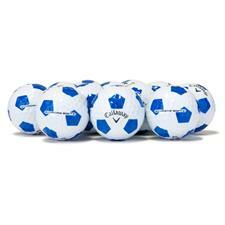 The Chrome Softs legendary feel is provided by a combination of the Tour Urethane Cover and lower compression core. The soft feel means high spin from wedges, saving strokes from pitches and chips. 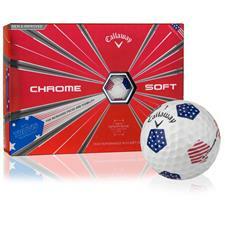 You are about to post a review for Callaway Golf Chrome Soft Truvis Red Golf Balls based on your knowledge of its playability. This review will show up under all variations of Callaway Golf Chrome Soft Truvis Red Golf Balls, including new, personalized, and custom logo.